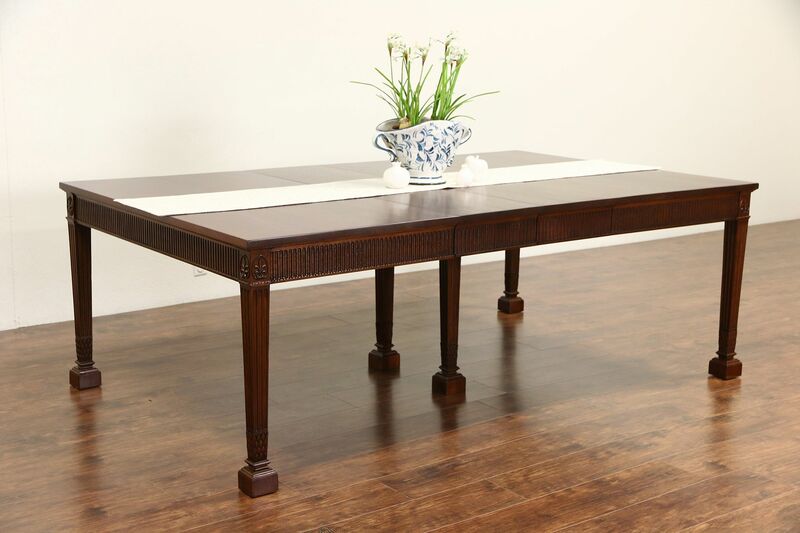 A traditional Georgian style dining table from the 1950's is solid mahogany with 7 leaves and center legs for extra support, signed "Watson & Walton, Chicago." The restored finish is in excellent condition on this American made vintage furniture. There are minor losses in the carved detailing, see photos. Two leaves have matching skirts or aprons, five more do not, all are 14" wide. Measurements are 54" wide, 30 1/2" tall, legroom is 24 1/2" underneath, length when closed is 5,' with the two skirted leaves length is 87 1/2," and with all five leaves length is 13' 1" overall. Related chairs in photos are priced separately, call or email for availability.